Bus to Nah Trang, up through the mountains again - amazing views. Stopped at a gorgeous roadside cafe on route with a waterfall and river running beside. Weather was great, sun shining and I was gradually feeling back to normal. Saw an unhappy sight, a small monkey chained to a wooden post at the cafe, could hardly move anywhere and looked pretty traumatised from all the people stood taking photos. We arrive mid afternoon into Nah Trang and book into the Backpackers Hostel. Nice to be back in the social scene with other backpackers! We walk out to find some lunch, I ordere a salad nicoise - more like a Family salad. It was served in a huge glass bowl the normal size you'd put out on a table with a group having dinner. Not just for one person! That evening it rained A LOT! We'd booked onto a boat trip the next day, but sadly because of the weather we had to cancel! Spent the day at the Hot Springs, nothing like a bit of pampering when the weather is miserable. Met an Australian guy who was travelling with his 7 year old son, think the dad was missing some adult conversation but they seemed to be having a lot of fun. The kid had been taken out of school for 3 weeks to go traveling...lucky guy! Was a very fun day, chilling out in a muddy bath tub and hot 30 degree water! Went across the VinPearl waterpark, the island across from Nah Trang beach. The weather was still pretty miserable so didn't want to do the boat trip. Took a cable car across over the sea and spent the day in and out of water slides and lounging on the 'fake' beach. Went on one ride called Tsunami - ridiculously high! Me and Luce went down as a pair on a double dingy, dropping from an almost vertical hight to then slide back up another slide. Because of the force of the slide and the angle that we dropped, both of us got whiplash as our necks slung back - killed! Pretty scary waterpark! That evening, we took a bus to Hoi An - 11 hours. Our first experience of a sleeper bus..not the comfiest journey. We book into Hop Yen hostel. We spent the afternoon exploring the lovely french cobbled streets and cute alleyways along the riverfront. Hoi An is THE place to go if you want tailored goods, so both me and Luce treated ourselves to some new shoes! Hoi An looks so pretty at night, lanterns light the riverfront, fairy lights hung in trees and cobbled streets bustling with tourists and vietnames fresh food stalls. Coconut doghnuts are the best! 5 hour sleeper bus to Hue...first impressions...RAIN!! It seems more like a drisley English town than Vietnam! The weather was so crap that we were'nt really able to explore much by foot and to take a cyclo would just mean we would get even more wet. So instead, we found a masssage parlour and spent the afternoon having some pampering! We booked in for a 60 min body massage, absolute bliss! The vietnamse certainly know how to massage, the girl was standing on my back, kneeling on my arms...felt strange but worked wonders! The weather continued into the next day, so we struggled to find anything to do inside. We spent most of the morning writing our journals in a cafe, watching the world go by and then in the afternoon walked to a supermarket to stock up on snacks for our next big journey to Hanoi. Waiting for our sleeper bus to arrive to Hanoi, we got chatting to a girl who was waiting for the same bus. She was travelling on her own several months, 2 months into her trip at the moment. We were heading in the same direction, so arranged to book into a dorm at Hanoi Backpackers when we arrived. The bus journey was long and uncomfortable. Drivers out here beep constantly..gets insanley annoying!! And makes it difficult to sleep. We arrived the next evening into Hanoi, sleepy eyed and cold. Booked into the Backpackers - newly opened 2 weeks before we arrived, so the decor and facilities were brand spanking new and loverly! It got a big thumbs up from me, as we got free breakkie every morning which included a big mug of TEA!! Halong bay trip, organised through the hostel. Such a memorable experience! 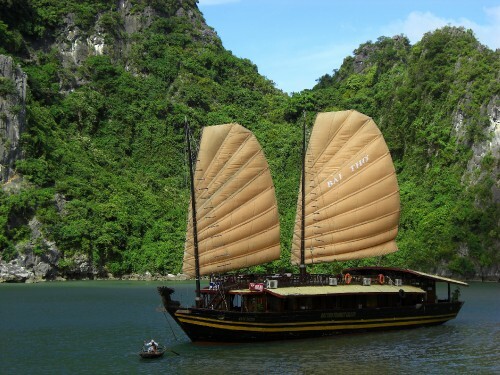 Met a great bunch of people, sailed out to Halong Bay in the 'Jolly Roger' and spent a night on the boat. Played some ridiculous drinking games, including the lethal ring of fire! Jumped off the side of the boat into the sea, stupidly high!! Went kayaking across to some caves and another cove where we walked up a steep rocky hill to watch the sunset....it was a very sad walk for me as just as I was stepping out of my kayak...my haviana broke AGAIN!! Luckily back on the boat they had more superglue to fix it! The 2 day trip was definately my highlight of Vietnam, met some great people and had such a laugh. My Haviana will continue to survive!! Spent the next few days exploring Hanoi, tasting some delicious food and spending way too much money at the amazing markets!